Mary-Ann Feller wears many hats at Mt. Airy. She is the proud director/owner of the school, but her first love will always be classroom teaching and interacting directly with students. Mrs. Feller is also a former Mt. Airy parent. Mrs. Feller teaches our graduating class as well as the music and French programs. She plays multiple instruments, speaks two languages fluently, and understands two more. Mrs. Feller also runs two astronomy/telescope programs for children: Mt. Airy Under the Stars here at Mt. Airy Nursery School, and the Young Astronomers’ Camp for the Southern Cross Astronomical Society’s Winter Star Party in Florida. Mrs. Feller was destined to be a teacher, having opened her first summer camp, (with her mother as her assistant teacher,) when she was just five years old! Mrs. Feller comes from a military family and moved a great deal as a child. This background gave her personal insight into a variety of teaching styles and philosophies as well as experience with a wide range of people, both of which help her empathize with her students and their families. Mrs. Feller is licensed as an early childhood teacher by New York State, New York City, and the National Board for Professional Teaching Standards. She is a New York State Distinguished Educator and was honored at the White House for her teaching. 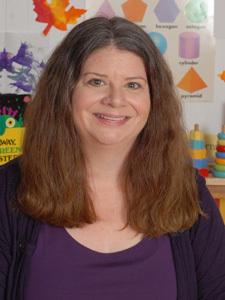 Mrs. Feller has served as an education consultant for a teacher-education textbook and the Magic SchoolBus television show. Mrs. Feller lovingly refers to her home in Cortlandt Manor as “the zoo” and she lives there with her husband, two children, three cats, and a dog.